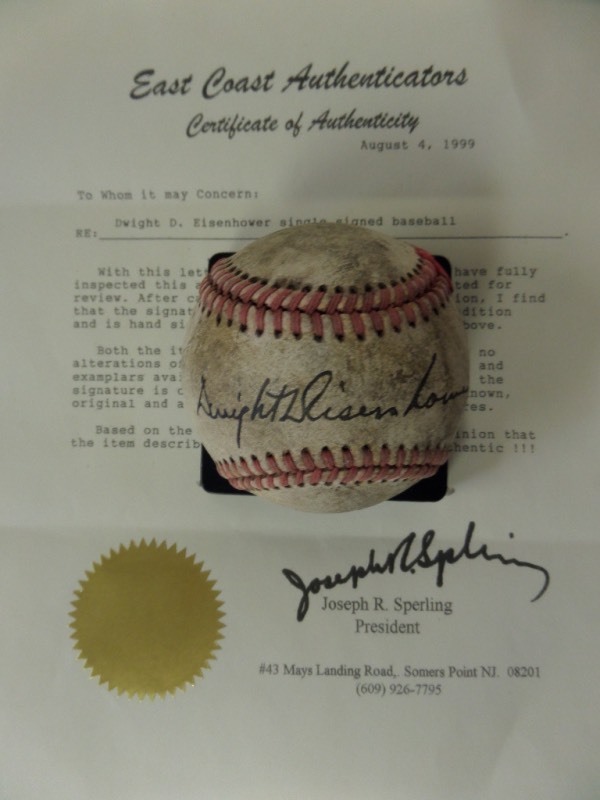 Coach's Corner - Dwight Eisenhower single signed/certified vintage baseball! Go Back to Lot List Dwight Eisenhower single signed/certified vintage baseball! This vintage red-laced baseball comes to us in F+/G overall condition, with much age evident. It is hand-signed across the sweet spot in black by 34th United States President and former Supreme Commander of the Allied Forces, Dwight Eisenhower, grading a solid, legible 7. Comes with a COA from East Coast Authenticators for certainty, and retail is well into the thousands on this gem!